Accessories make a big difference to a minimalist wardrobe so after dropping a few (hmmm) hints I was very pleased to receive two lovely pieces from People Tree's jewellery range for Mother's Day. I already have a few items from People Tree - a cardigan, t-shirt and skirt - and love the fact this company promotes Fair Trade and sustainable fashion. And their clothes are so comfy to wear - that's so important to me these days. However, my wardrobe is more or less complete at the moment so rather than looking at new clothes I've been looking to accessories to add interest and trend to my outfits. What I love about these two new pieces is the colour – I've been infatuated with coral since buying my sequinned top last year and know that these earrings (Dana bead earrings) will chime beautifully with this top and update other pieces too. And yellow brings a bit of brightness to anything so these bangles (6 palm bangles) will cheer my black jeans and my summer whites. 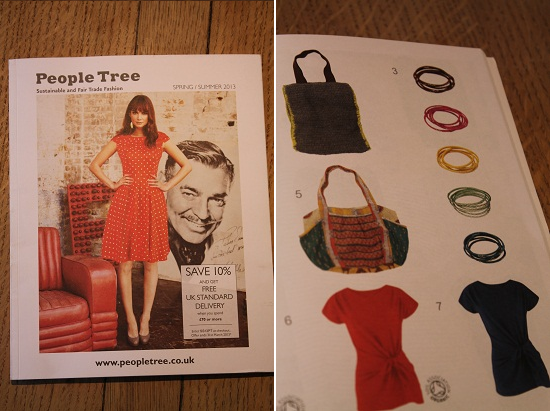 People Tree is one of the ethical companies I turn to when I need to update my wardrobe. Knowing that these earrings are handmade in India and the bangles are made from sustainable keya palm leaf means a lot to me. How's your minimalist wardrobe coming along? Do you rely on accessories to update your wardrobe? They are both lovely, but the bangles are my fav as I love yellow! I really like People Tree. I don't buy clothes very often but I like to buy from them when I do go shopping. Their clothes are really nice quality and really comfy. Our local independent department store has started stocking some of their clothes too which is fantastic.